Migori county leader from Luo community have accused Deputy President William Ruto of favouring their Kuria counterparts in development. On Monday, Ruto visited Luo area of the county after heavy criticism from Luo leaders earlier which never subsided even after the tour. On Saturday, Ruto will skip the launch of the Isibania-Kehancha-Kegonga-Ntimaru road in Kuria, after failing to launch the completion of Masara-Muhuru Bay road on C13 road. Ruto had commissioned the C13 road whose first phase was to cover Muhuru Bay-Masara-Migori, but was pushed over to continue to Kehancha town, up to Tarang’anya in Kuria region. Among Ruto’s main critics is Nyatike MP Tom Odege who said his coming was a ‘big waste of time’ for his constituents as even the last segment of the road is not budgeted for completion. “I am a member of Roads Parliamentary Committee and I can authoritatively report that the Muhuru – Masara road which he launched in my constituency is non non-existent,” said Odege said. Suna East MP Junet Mohammed, termed the tour as outdated with Suna West MP Peter Masara saying street lighting project Ruto launched in Masara center was done ago. 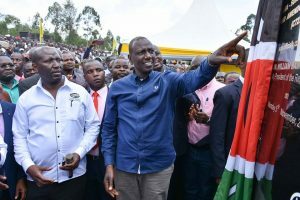 On Monday, before he begun addressing the crowd Ruto apologised for favouring Kuria in his development tour and ignoring Luos, which might have forced him to avoid launching the Isibania-Kehancha-Kegonga-Ntimaru who work begun last week to avoid more political backlash. The road links Migori County to Narok county, had excited locals, most of who are hopeful that the road will open up the remote region to investors.